I have been absent from the blog for a couple of weeks and I apologize. The reason? 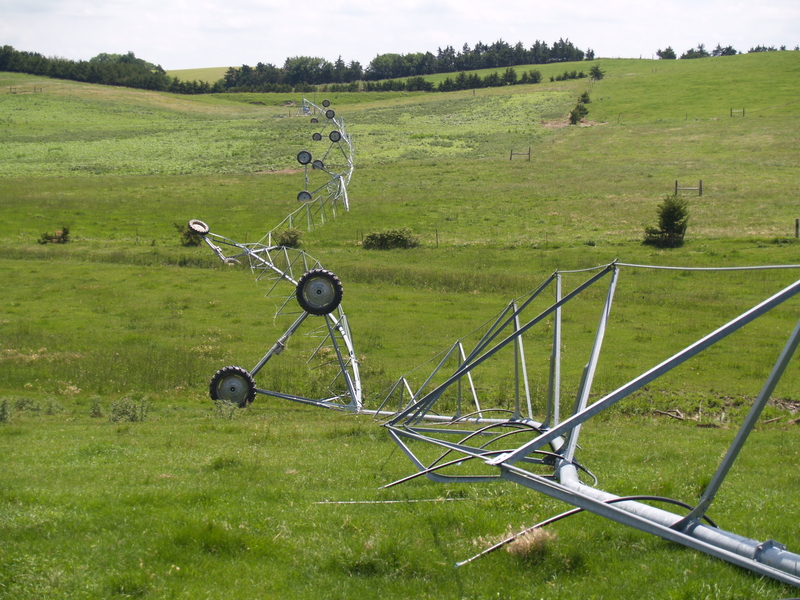 On June 20, we experienced a tornado that removed a section of the roof, blew in a patio door (the same one pictured in “The Bull In the Window“), knocked down our irrigation pivot, and destroyed many of the biggest trees on our farm. This blog is meant to be a lighthearted look at farm life and so I’ll stick with that theme. I’m fortunate to have that luxury–no one was hurt and I’m aware of many people that have experienced much worse at the hand of Mother Nature this year. The day leading up to the tornado was a normal “storm preparation” sort of day. The forecasts all warned of severe weather. The tone was ominous and I took them seriously. I put in my normal work day and, after that, the kids and I went outside to pick up toys and bikes. We covered garden plants, brought in the pullets (young female chickens) from their outdoor pen, and moved the basketball hoop into the garage. We also checked pets and livestock to be sure they had shelter. The radar map was displayed on my computer at all times that evening. I checked it frequently to ascertain how long until the storm reached us. The only animals not following my plan were the chickens. My sons’ hens do not normally go into their coop until dusk. On a normal day, the boys head outside shortly before nightfall and close the door to protect them from predators. I was concerned that the storm would hit before the hens went into their coop. With high winds predicted, I wanted to be sure the door was closed tight to prevent the whole building from blowing over (spoiler alert!). Since it was almost dusk and the clouds made it seem darker/later than it really was, I asked hubby to drive the boys over to the chicken coop early. I was wary of the black clouds south of us, so I did not want the boys to do their usual walk to the coop. I estimated we had 15 or 20 minutes until the storm arrived. Curtis agreed to drive them and, as we hoped, the hens had roosted early. The door was closed and the boys sprinted back to the pickup in the rain. 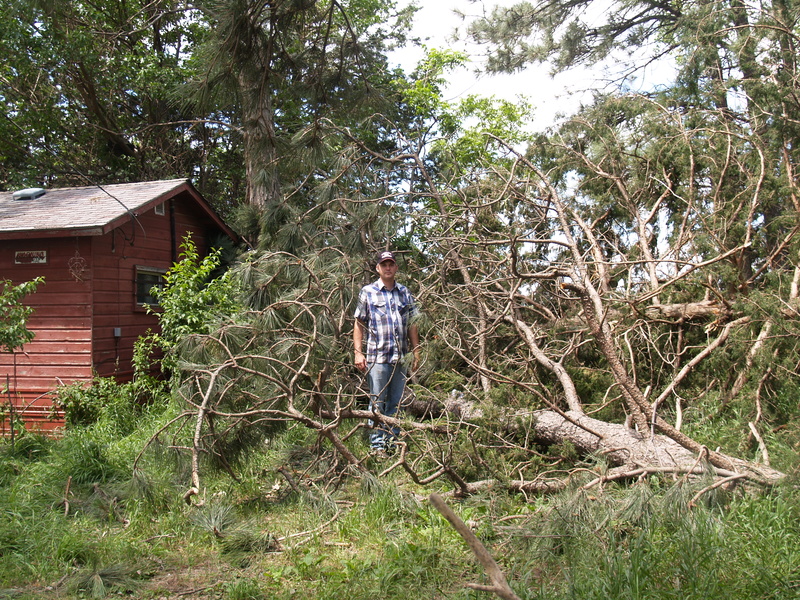 By the time they drove back to the house, large branches were coming off cottonwood trees and floating through the air. My 15-20 minute estimate was seriously wrong…I later learned the storm front was moving at over 60 miles per hour. Curtis managed to get to the garage and get the door closed. Like good farm people, we gravitated toward the kitchen windows to watch the storm. I had supper on the stove (no warnings had been issued at this point). After we watched our youngest son’s playground slide fly upward about a dozen feet, I became concerned. Within seconds, I began to hear the terrible sounds a building makes when it begins to rip and break. The large (10 feet high by 16 feet wide) window on the south side of our house began to flex and move. I couldn’t hear the storm as much as I could feel it–like the deep bass rumbling of the trains that pass within a few miles of our house. At that point, we headed to the basement and everything seemed to break loose simultaneously. The patio door blew in. This changed the air pressure in the house so violently that doors slammed shut, displacing their jambs, cracking trim, and lifting up the ceiling in our entry. We got the kids into the storm shelter (a room completely enclosed by concrete under our front porch). 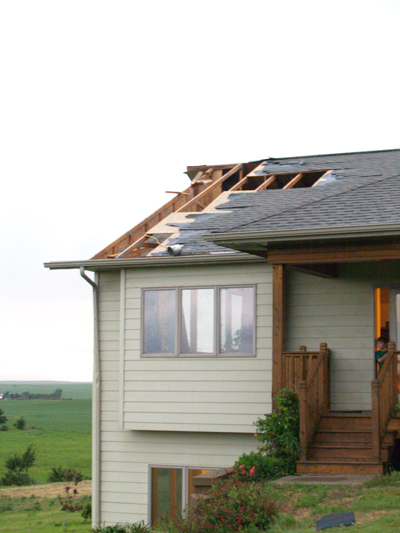 Hubby and I began to run around the house looking for other damage. If you are wondering why we were so cavalier about running around in a weather event that obviously had to be a tornado, it is partially because we built a concrete house. The core of the entire structure (both levels) consists of eight inches of steel-reinforced concrete. Our entire house is a tornado shelter. The fact that I built a concrete storm shelter inside of my concrete house should tell you something about the planning-overkill genes I inherited from my mother (Thank You Mom!). After the storm passed, we ventured outside. It did not take long to notice that part of the roof was missing. Our first phone call was to the contractor who built the house (a local guy who lives about 6 or 7 miles away) to ask if he could send a crew in the morning to fix it. His response: “There is more rain on the way. I’ll make some phone calls and have people there in an hour”. We had a crew on our roof before nightfall securing plastic and tarps. The owner of the local lumber yard even went down and opened the door for them to get the supplies they needed on the way to our house. While we were waiting for the crew, Curtis and our oldest son ventured over to the cattle yard to check out the damage . Many (MANY), beautiful old trees were snapped off or uprooted. The chicken coop did a somersault and landed on its roof. Curtis reported that the black hen was dead under the rubble, but all of the other animals were fine. The dog house (it is actually a cat house, but people look at me funny when I say that) was gone. The small food dish next to it was undisturbed. The next morning, I ventured over to the cattle yard. The poor hens had moved back to their coop, but since it was upside down, they were getting very wet in the rain. They were obviously confused at the changes in their home. I could see the black hen underneath. The oldest son wanted to bury her right away so he went in and tried to pull her out. Soon, I heard “Mom–she’s alive!”. Sure enough, that feisty bird lived through the ordeal. She could not move one of her legs and was evacuated into luxury accommodations in the garage with three boys attending to her every need. I can now add “chicken physical therapist” to my growing list of skills. As of July 2 (when I write this blog) that hen is almost fully recovered and is back with her flock-mates. We are fortunate to have a friend who is a contractor and was willing to push his normal schedule back a week to rebuild our roof. My brother is a finish carpenter and came down to secure siding, fix door jambs, and put the old patio door back into place until the new one arrives. My father decided that his special project was rebuilding the chicken coop. After hubby flipped it back up onto its foundation, Grandpa and the older children fastened everything back into place. My mother watched our youngest son (incredibly important given the large number of cars driving in and out of our yard) and fed everyone. My mother-in-law and brother-in-law drove three hours (one way) from Minnesota to bring equipment for clean-up and moral support (and are now facing their own clean-up since a tornado hit them less than two weeks after ours). Many more friends checked fences, cleaned, brought food and beer, and offered prayers and help in ways that we probably do not fully appreciate yet. We are so lucky to live near such wonderful people. We did not grow up here. By many measures, we are still “outsiders”. However, we feel “adopted” and part of this community. This tornado may have damaged our house and farm, but it certainly reinforced our belief in the goodness of humans. We are lucky. We are lucky. I keep saying that to myself and people keep congratulating me on my positive outlook. I do not deserve that congratulations. It is the sincere offers of help and well-wishes that lead me to believe that “we are lucky”. I used to think that people made their own luck. I now know that is false. We have not done anything that merits the outpouring of support and help we have received. I just hope that we recognize opportunities in the future when we can “pay it forward” and somehow live up to the high standards we now recognize in our community. In the meantime, I’m going to post my “chicken physical therapist” resume on job hunting websites. You never know…..
I’ve heard so many cool things about your house. I just have to get there someday and take a tour! Sounds like you’ll be 100% recovered in no time. Thanks Leslie! You are invited any time.